This weekend was so much fun. One of my oldest friends is in town for a job interview and made it a four day trip so that he could explore New York because he'd never been here before. That meant I spent the weekend being a tour guide, which I love to be, and even doing some NYC activities I'd never done before. Noah and I have been friends since we were in the same 6th grade class. This visit is the longest we've seen each other since after my freshman year when I was home for 2 months over the summer. Otherwise it's a day trip when we're both in Washington or a quick coffee before one of us flies away (he went to undergrad in San Francisco and just rocked his first semester of law school in Sacramento). Noah is a rockstar and was down to run 3 miles with me on Saturday after flying overnight to NYC. I was going to do my long run with the Lululemon Run Club, but after snowfall the night before I was nervous about ice (and I'd only gotten 5 hours of sleep because Sourabh and I were up late cleaning -- oops). We ran around the Reservoir then hit up a few more touristy spots. also, he's wearing shorts. whaaaat. Like the Guggenheim! Noah is a huge architecture buff (I've been learning things as I lead him around the city) and wanted to see it. We also ran past the Met then jogged along the Great Lawn so he could see the great skyline views from there. 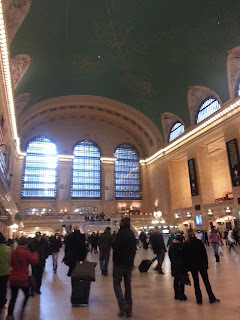 We relaxed and recharged that afternoon before going to one of Sourabh and my favorite restaurants in New York, Alta. We've been there at least 10 times and always enjoy ourselves. Great food, atmosphere, and drinks! We went to a sports bar to watch the Knicks lose badly to the 76ers (thank goodness they won last night or else I'd be really worried), then headed back home to hang out and watch a movie. Since we didn't get to bed until nearly 2 AM, I decided to postpone my long run till Monday so that I could spend all day Sunday sightseeing with Noah. 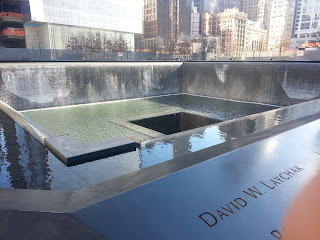 First we went to the 9/11 Memorial, which I hadn't seen yet. The space is really beautiful and it's hard not to get contemplative as you look at the fountains and see the names of those who died on 9/11. It's a lovely memorial and I'm glad I finally saw it. Next we walked to Battery Park so that Noah could see the Statue of Liberty and Ellis Island. Once he'd gotten the requisite picture with the Statue of Liberty, we walked up to SoHo and grabbed lunch from Chipotle (cheap lunches for the win). 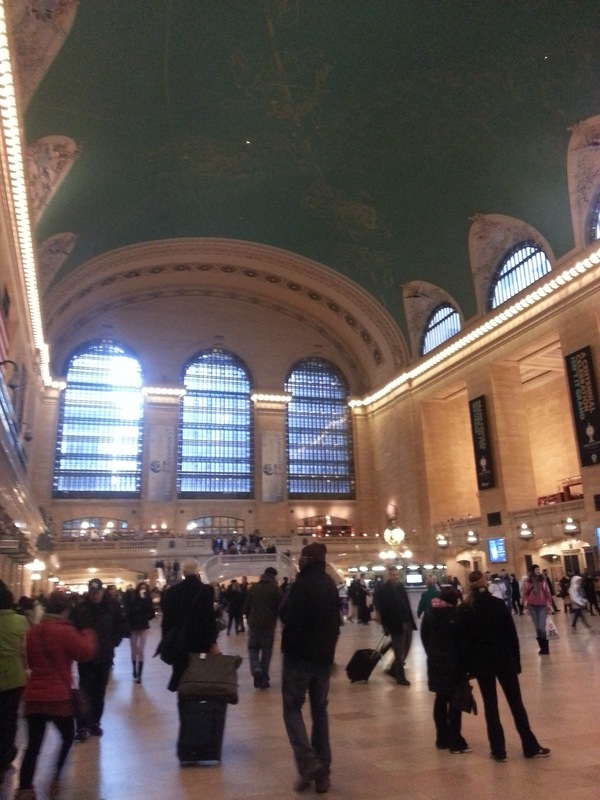 We ended our day by going to Rockefeller Center by way of Grand Central Station. I walked through this every day last summer on my way to work, and it was easy to forget how gorgeous the space is. I loved seeing it anew with Noah. We ended up on the Top of the Rock at the exact right time. The sun was setting so the city looked extra beautiful. Despite the cold, we walked around all three levels of the Rockefeller Center's observation decks to see every corner of the city. It was a fun two days of playing New York tourist. Unfortunately, I came down sick with some kind of stomach virus last night and I am extremely bedridden, so Noah has to venture out by himself today. My goals were almost all met this week, except for one 3 mile run (due to arch pain) and the long run (moved to Monday, which I think is fine because I completed last week's long run on this week's Monday). I also only did one strength workout, but I added planks and push-ups to multiple runs. Monday: 7 mile long run. My muscles were still very sore from the previous Saturday's strength workout and subsequent overnight plane ride with no sleep, so it was a slow run, but I felt great the whole time. If I'd been able to move my legs with less pain I think the pace would have been quicker, too! Made sure to foam roll and stretch after. Ended the day with a 2:00 plank for Abs By April. Tuesday: 7x400 for speed work, 4 miles total! I had to work all day so I completed this week's prescribed speed workout on the treadmill. I warmed up for 1/4 mile at 9:30 and took a 1/4 mile for recovery between each interval at 10:00. My first interval was 7:47 and got down to 7:13 for the last one. I think I could have started faster, but I'd never done 7x400 before--only 4x400--and wasn't sure how much I'd have left by the last one. Cooled down for .5 miles at 10:00 for 4 miles total. Ended session with 2:10 plank, 25 push-ups, then stretched and foam rolled in my apartment. Wednesday: Spin class with Beth at Flywheel UWS. She was a sweetie and came across town to spin with me! Also spent 30 minutes doing my yoga flow for runners and foam rolling, along with a 2:20 plank. Thursday: Unplanned rest day. I'd meant to run 3.5 miles on the treadmill after work and class, but I got up to the gym in my building and had such intense arch pain in my right foot that I couldn't run. I was extremely upset and tweeted about it, freaking out that it could derail my training. Immediately got amazing responses back because my runner friends are awesome. (Pretty sure the arch pain was due to wearing heels at work on Tuesday and Thursday -- wearing flats from now on and hoping that and the foot massage I got Sunday will cure the arch pain!) Went to my apartment and foam rolled, and still got in a 2:30 plank. Friday: 4 miles on the treadmill at a steady pace. Felt some arch discomfort but nothing so bad that I couldn't ignore it, and it didn't increase with the mileage or pace, and Saturday didn't bring worse arch pain so I don't think the pain is due to running. Finished with foam rolling and my record for this week, a 2:45 plank! 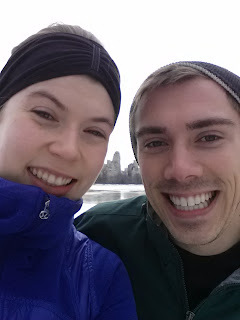 Saturday: 3.25 easy miles with Noah around Central Park. So much fun to share my favorite place to run with one of my favorite people! Minimal arch pain on this run and the rest of the day. Sunday: Yoga for runners flow and easy strength session comprised of lunges, squats, push-ups, planks, and one-legged deadlifts while watching the Screen Actors Guild Awards. Clocked out with a 2:00 plank. 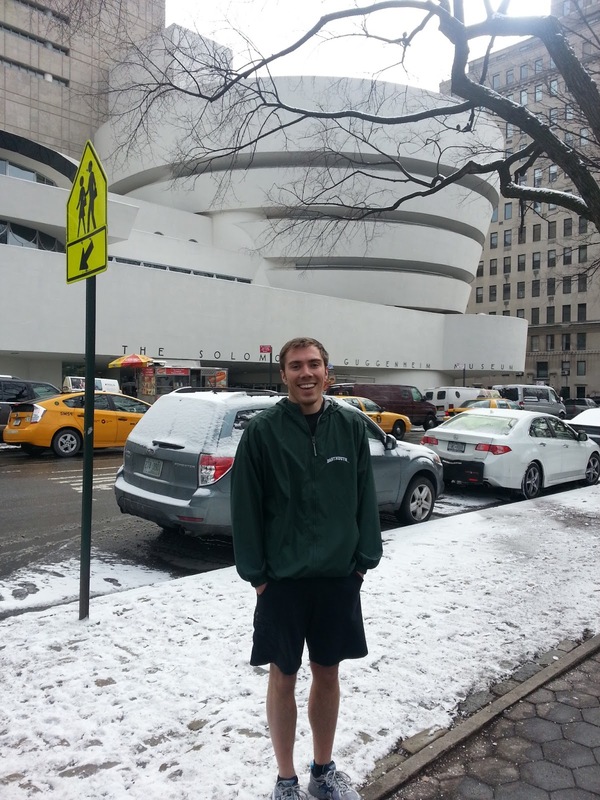 Also walked roughly 3.5 miles around NYC and got a 15 minute foot massage to try to improve arch issues. Hoping arch pain doesn't get in the way of any more runs, and I want to rededicate myself to strength training! Also, can this stomach virus go away quickly? I'd be very happy about that. Priorities: continue to foam roll and make sleep #1 on my list of things to care about. Did not get enough sleep last week and it clearly showed since I had a harder time dedicating myself to non-running workouts as the week progressed. Are you running any races this weekend? Do you like having visitors so you can play tourist where you live? I'm running a race on Saturday! Your weekend sounded like so much fun and way to go on those planks! Yes!! What pace are you shooting for?